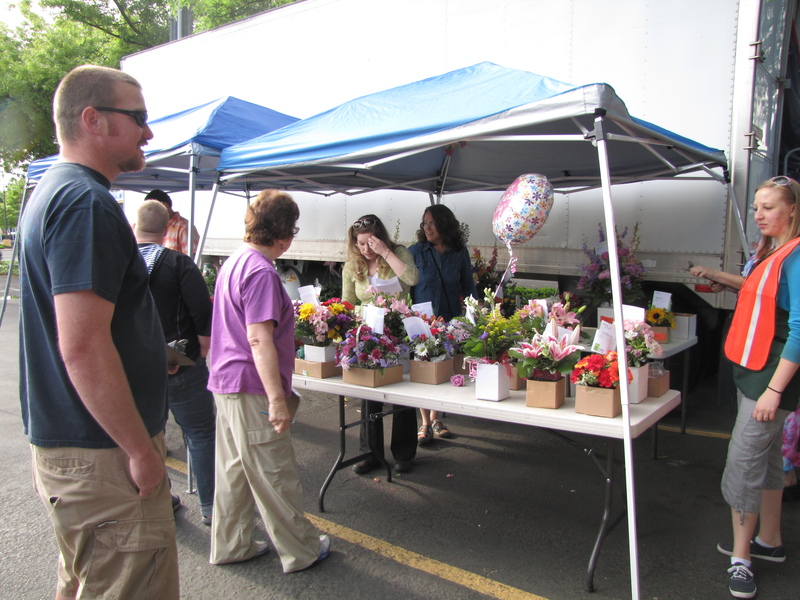 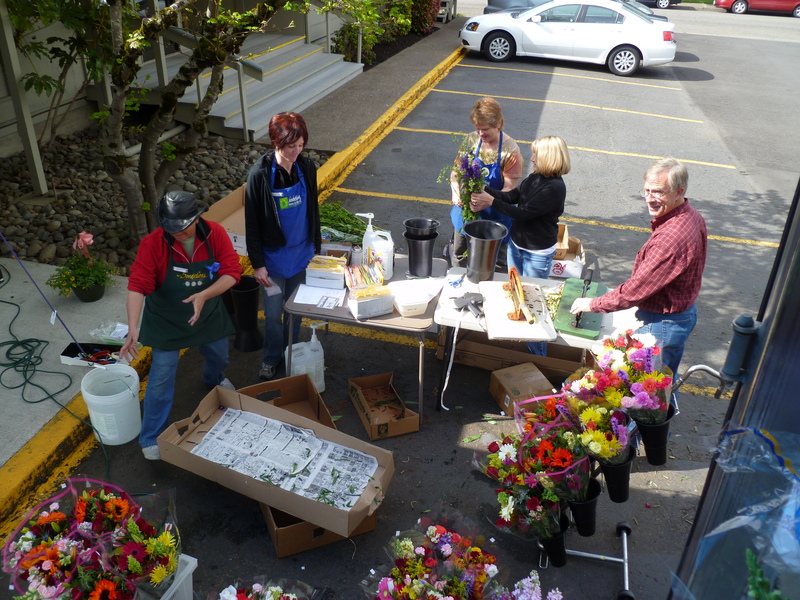 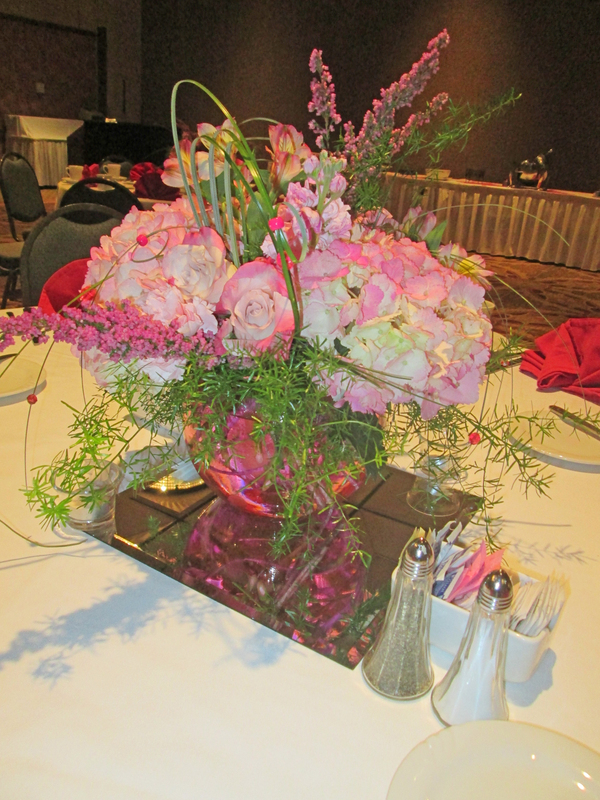 Julianne recently created the floral decorations for a fun, “over the top” 50th birthday party held at the Hilton Hotel here in Eugene. 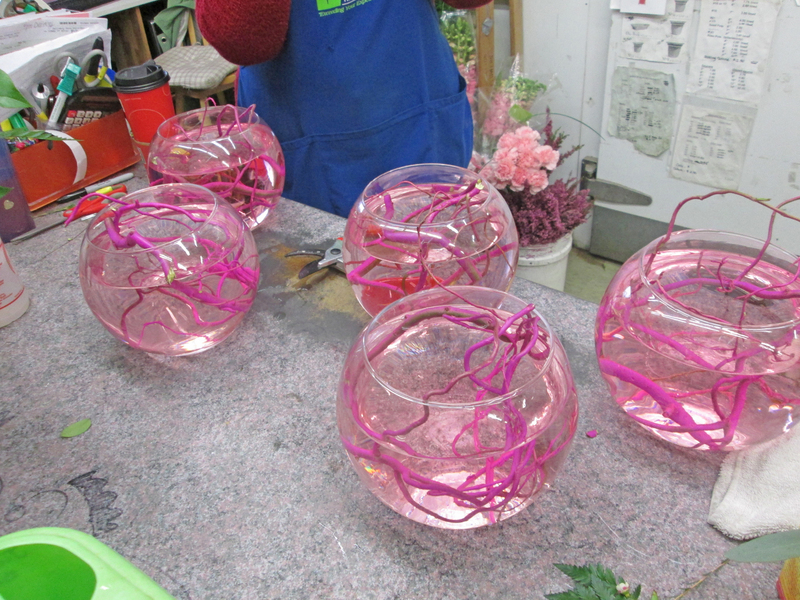 Since they wanted everything pink, Julianne started with pink curly willow branches curled inside large bubble bowls with pink-tinted water. 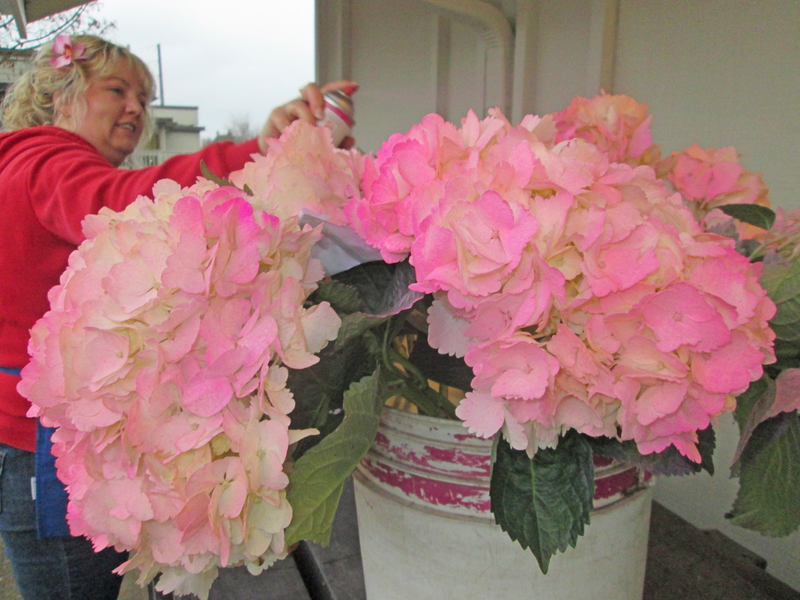 To get the hydrangeas a hot-pink hue, she gave white hydrangeas a hit of floral spray to make them really pop in combination with the other naturally pink flowers. 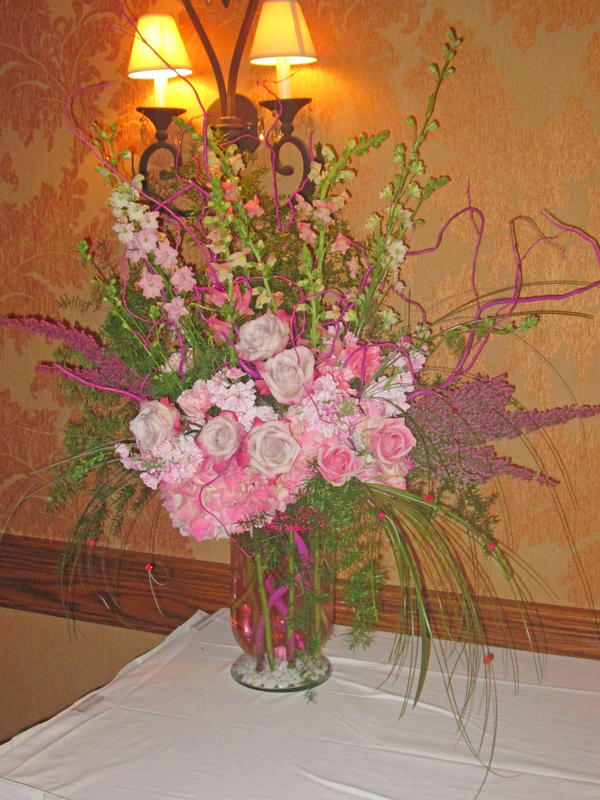 The large arrangements got a little extra pink glamour with hot pink rhinestone wrap and and explosion of pink flowers. 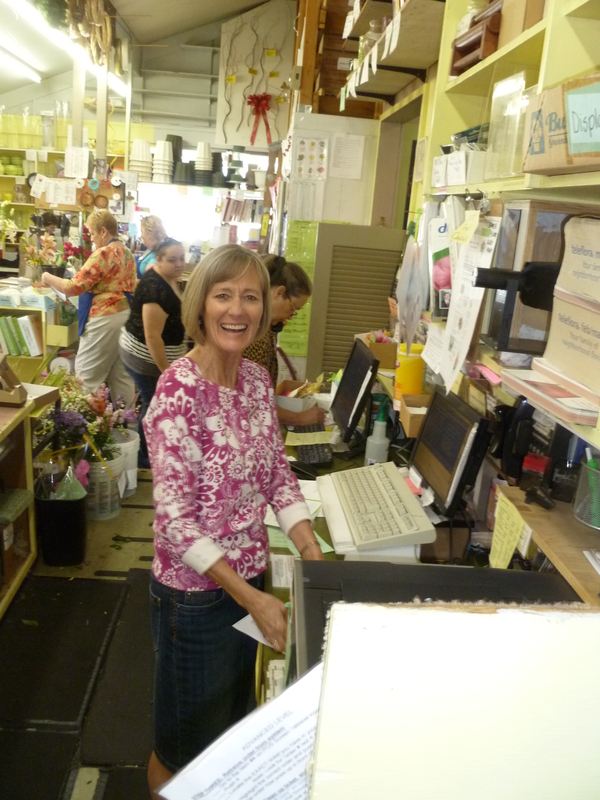 We love that this Birthday Girl didn’t shy away from the big 5-0 but instead celebrated in style! 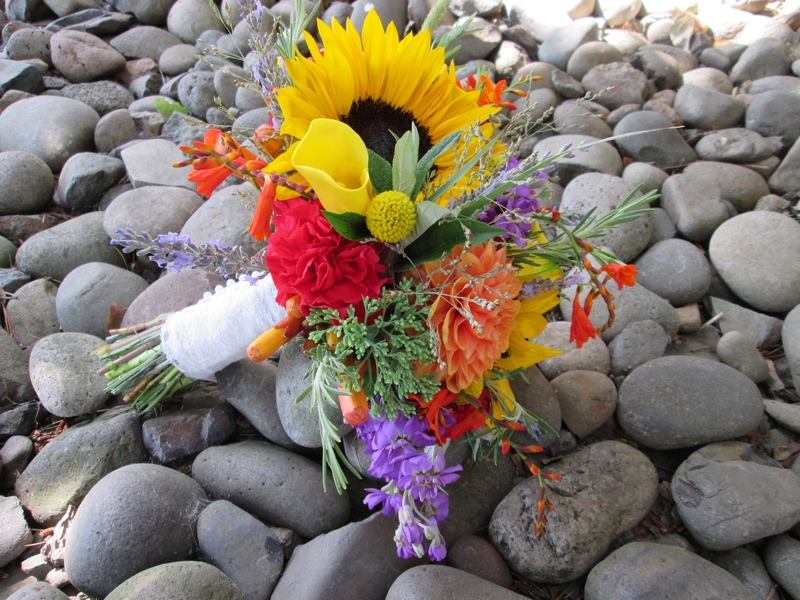 Oregon has such natural beauty and it creates a gorgeous, green backdrop for many a wedding. 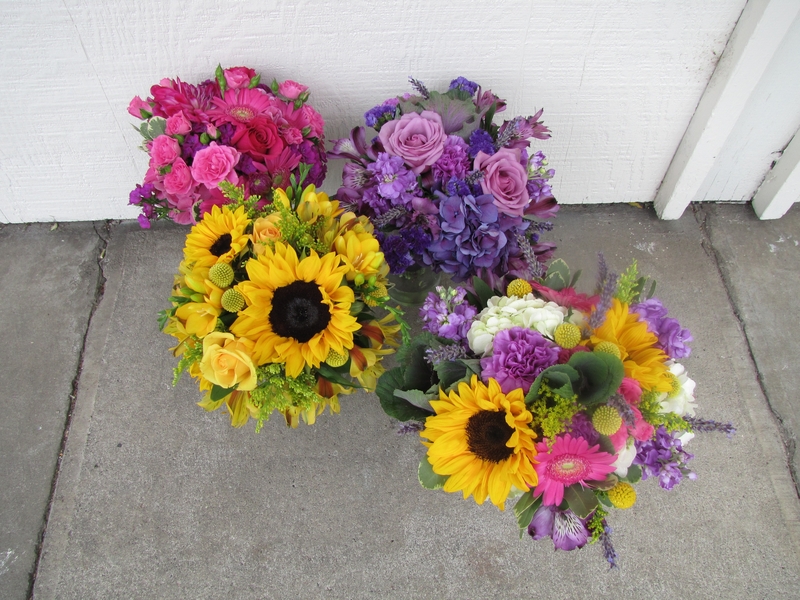 For this reason, and the ongoing trend of wildflower & colorful wedding flowers, many brides are choosing mixed colors for their wedding. 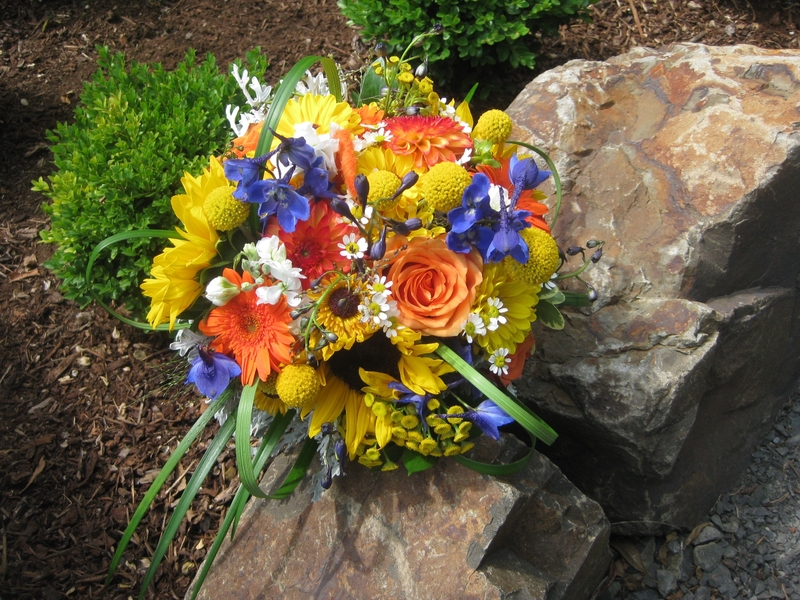 This transpires as either color groupings or mixed colors in all the bouquets and arrangements. 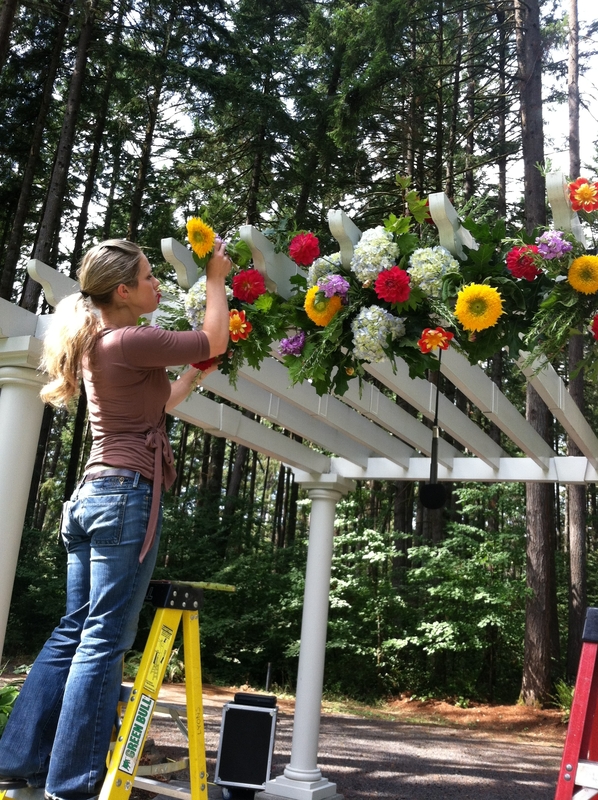 These mixed color weddings are best for outdoor weddings since they have a more casual, eclectic feel. 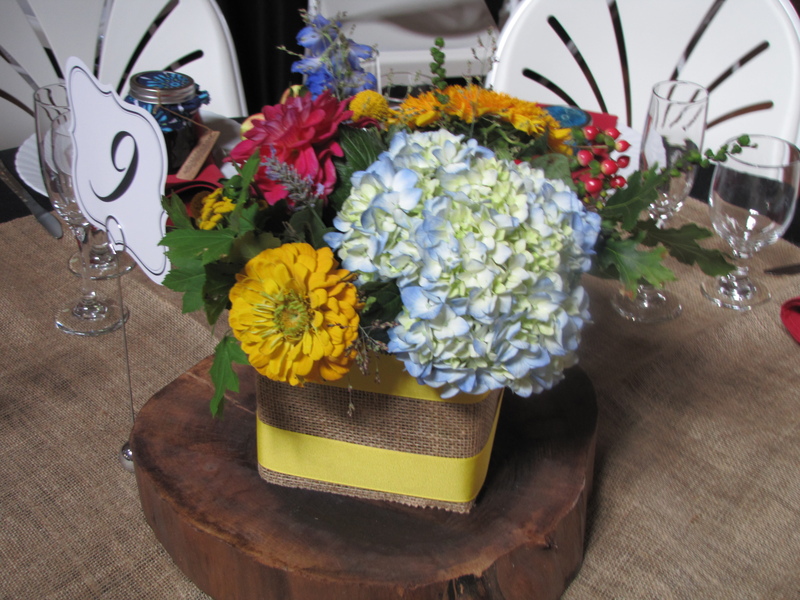 The mixed wildflower style pairs well with popular burlap and lace and works for both modern & colorful weddings or a bride who is going for more of a vintage feel. 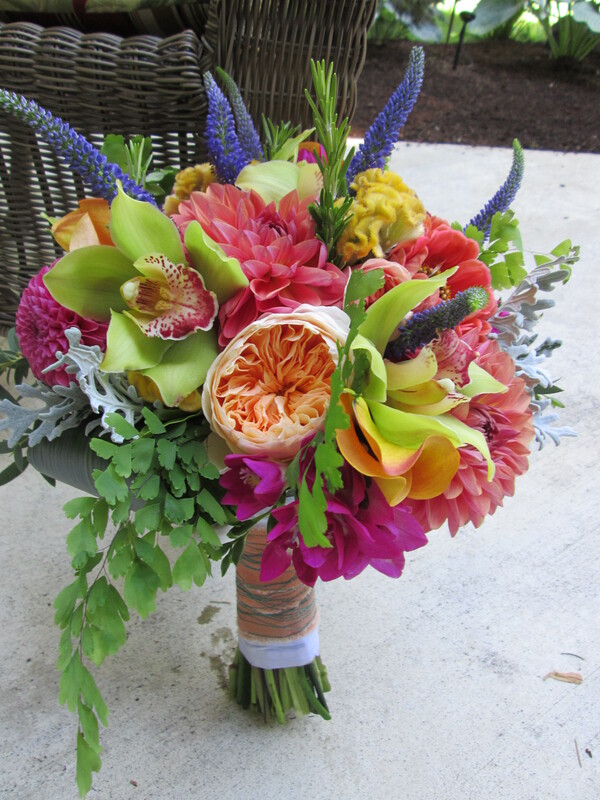 My favorite bouquet from this past wedding season: Juliet David Austin roses, cymbidium orchids, dahlias, zinnias, magenta freesia, Flame mini calla lilies, veronica, cockscomb, dusty miller and maidenhair fern. 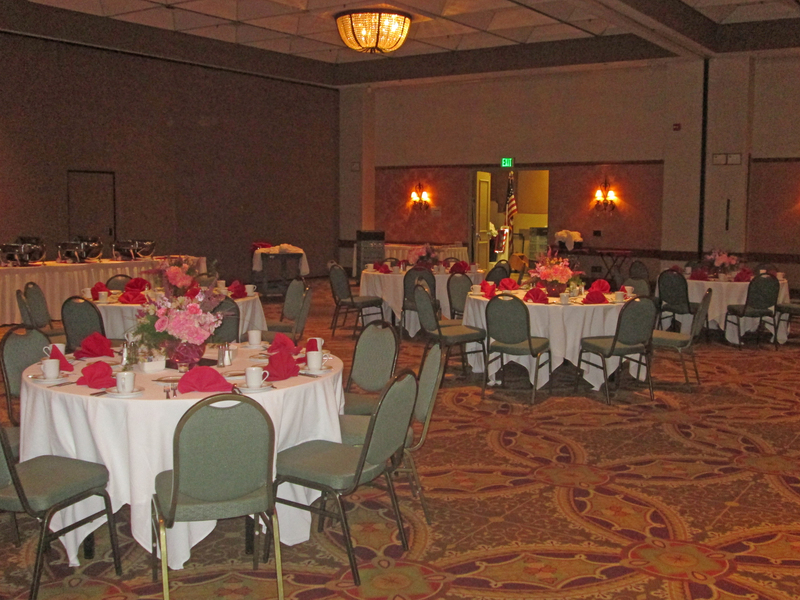 Each centerpiece for this Deep Woods Events wedding in Elmira, OR was slightly different but all were filled with color and placed on mirrored tiles atop teal cloth. 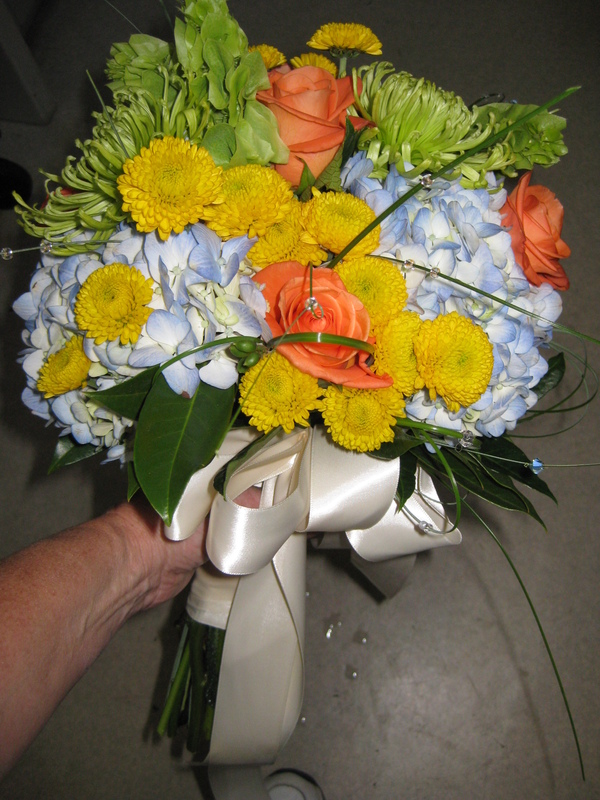 Colorful wedding bouquet of blue hydrangea, yellow button chrysanthemums, orange roses, bells of Ireland and green spider mums. 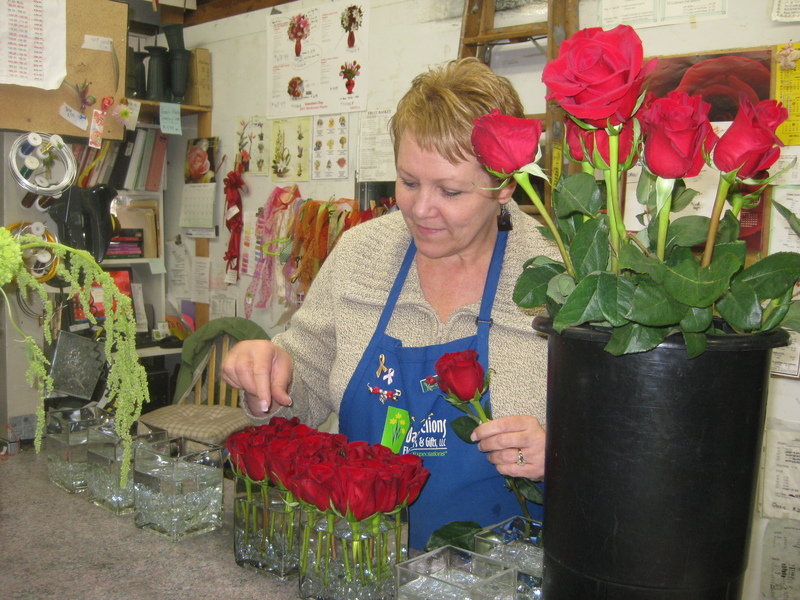 Roses for Valentine’s Day, right? It doesn’t have to be. 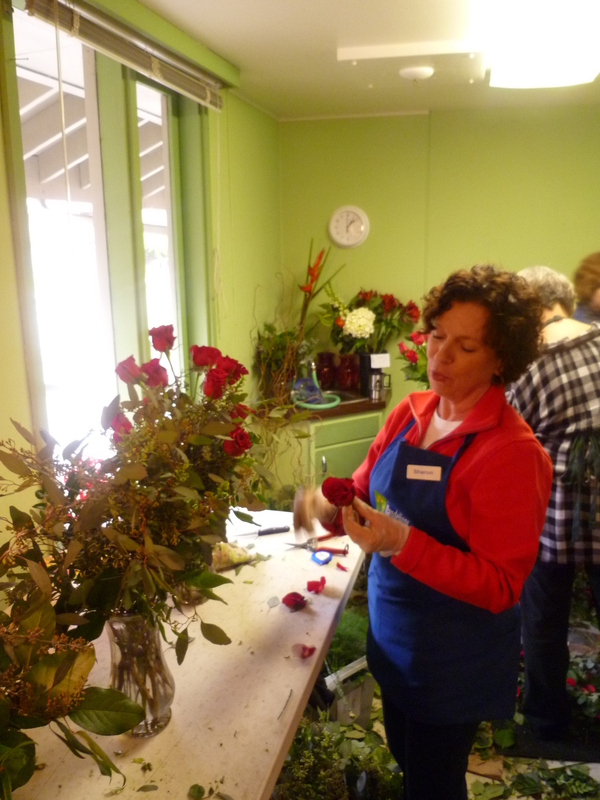 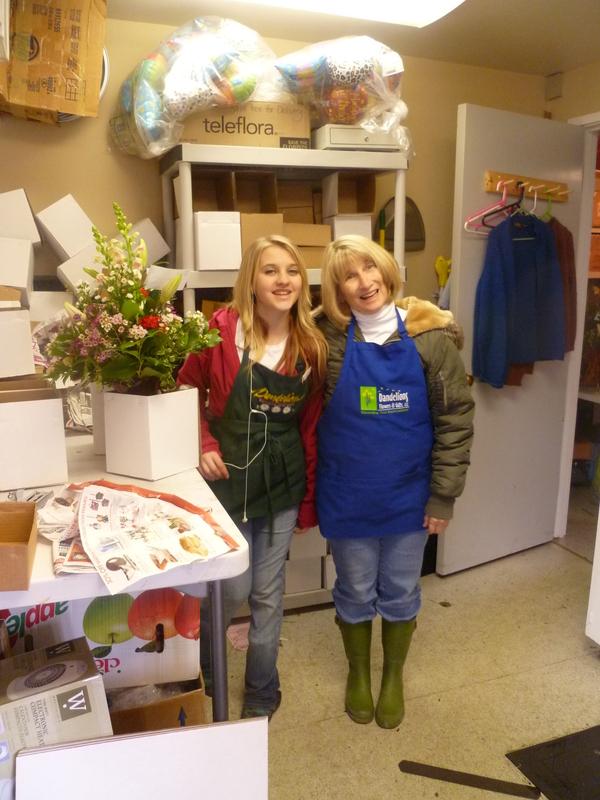 Although roses are the traditional flower choice for Valentine’s Day there are a myriad of choices to express your love. 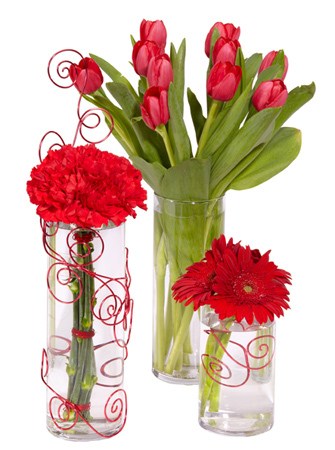 Red is the color of love so choosing a flower in this color still holds the implied message. 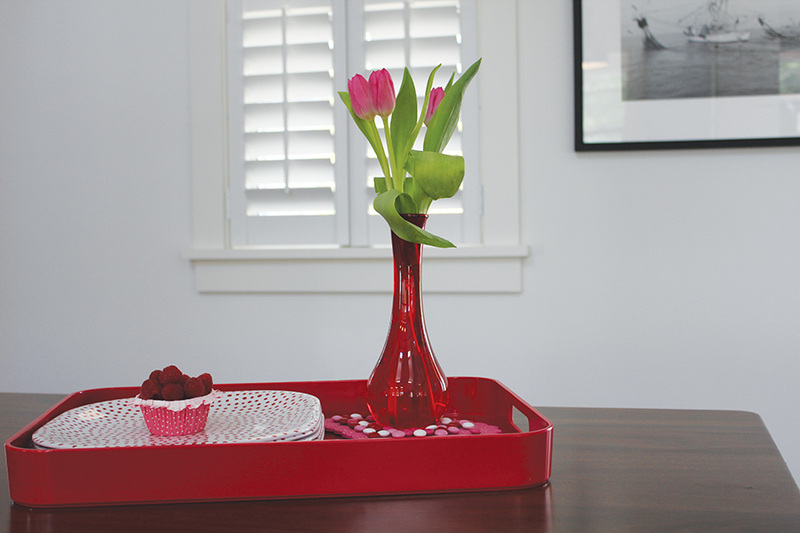 Tulips are a popular choice and they have such a unique nuance about them. 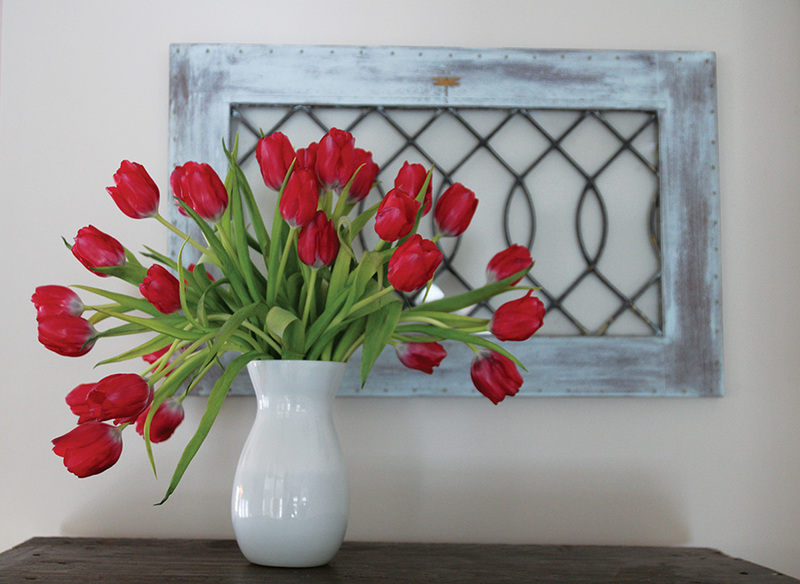 Tulips continue to grow after their stems are cut so they take on a life of their own, changing each day. 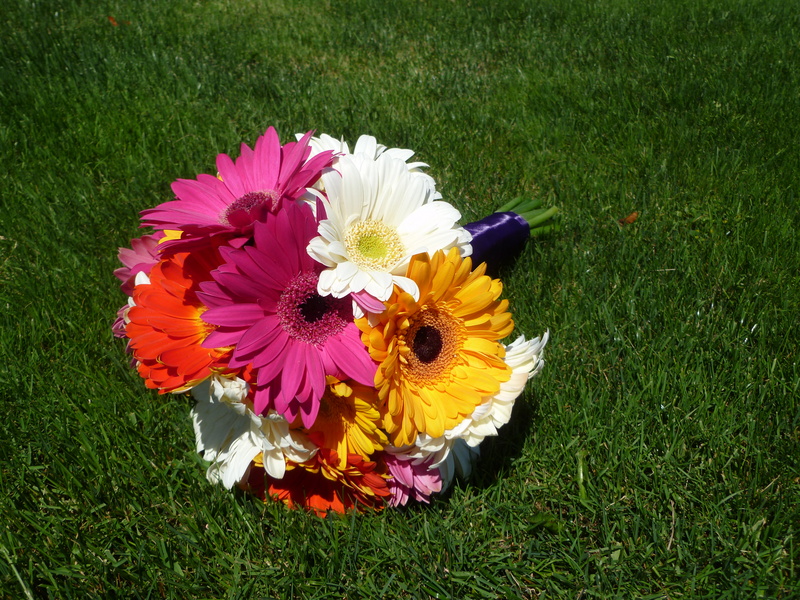 Gerbera daisies are refreshing and cheerful. 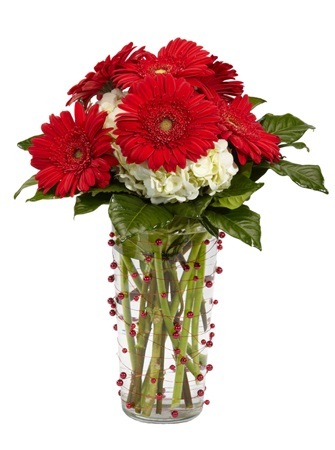 Their deep red hue looks amazing in a mixed, traditional bouquet or designed in a contemporary, modern fashion. 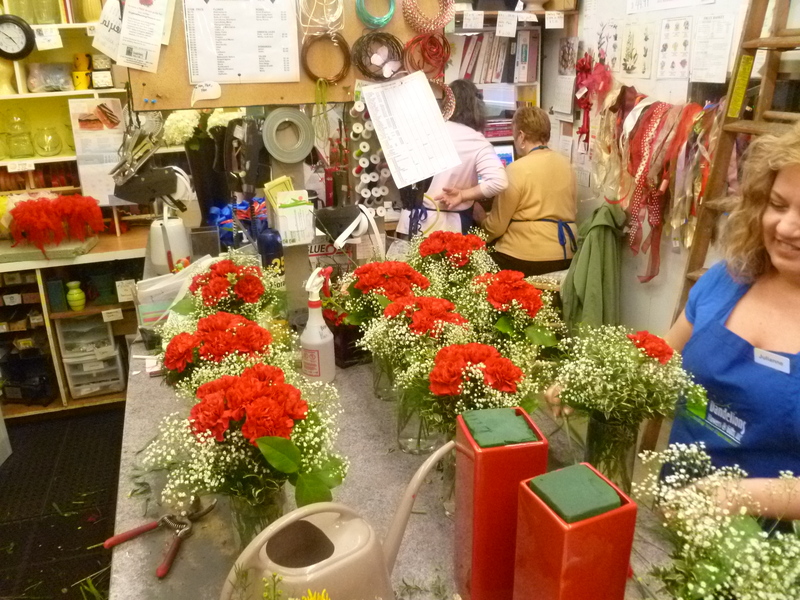 Carnations are ideal for a traditionalist and come at a fraction of the price. 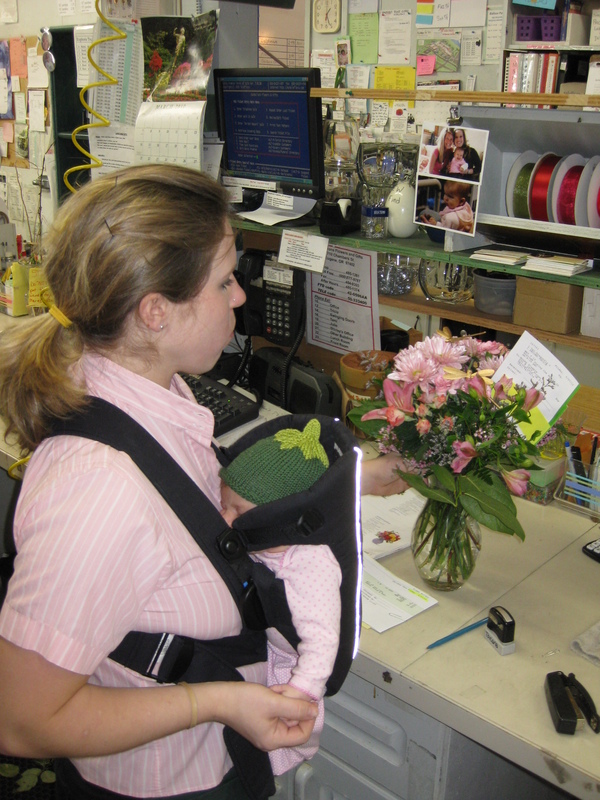 Steer clear of babies breath and ask for the carnations to be created in a low container for an updated look. 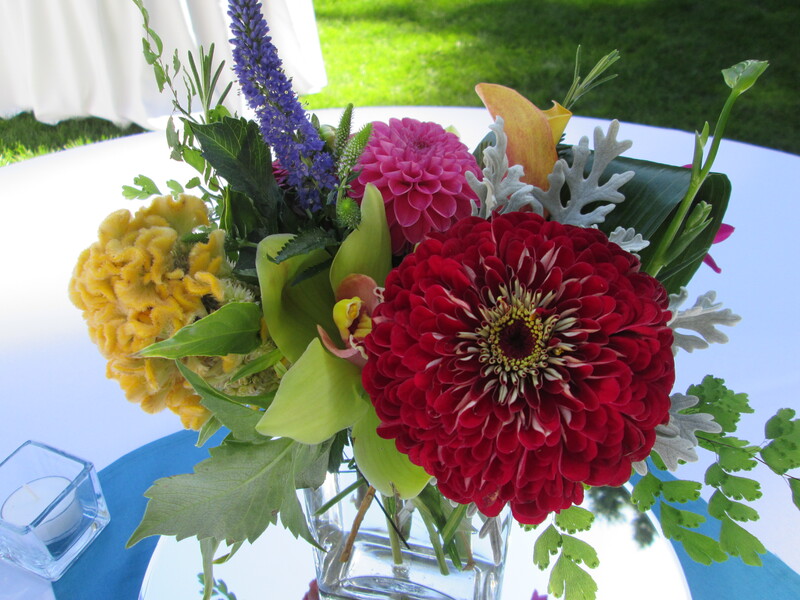 A mixed red bouquet can include a variety of flowers that are available including alstromeria, carnations, hypericum berries, gerbera daisies, or ranunculus. 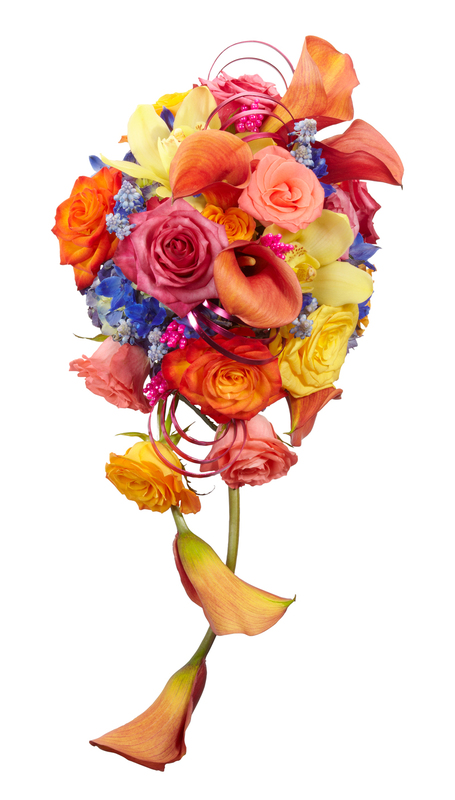 Tropical flowers are the perfect way to send something different. 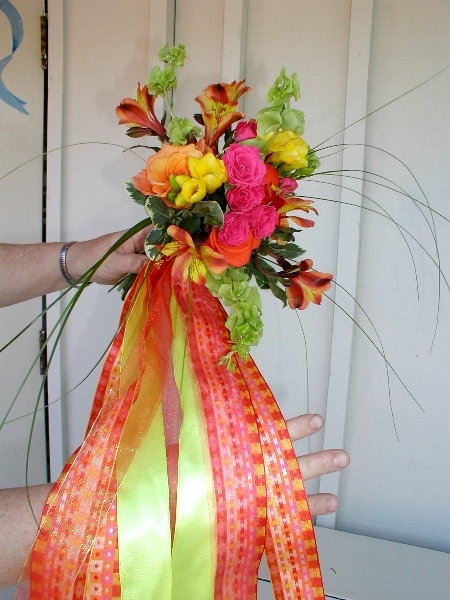 They are incredibly long-lasting and have fun colors and textures. 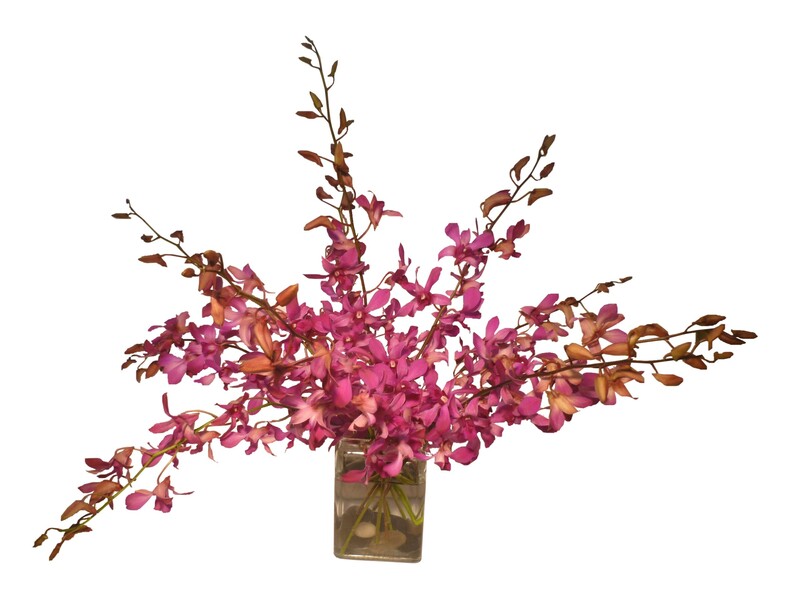 Personally, I think a vase of all orchids looks stunning all on its own. 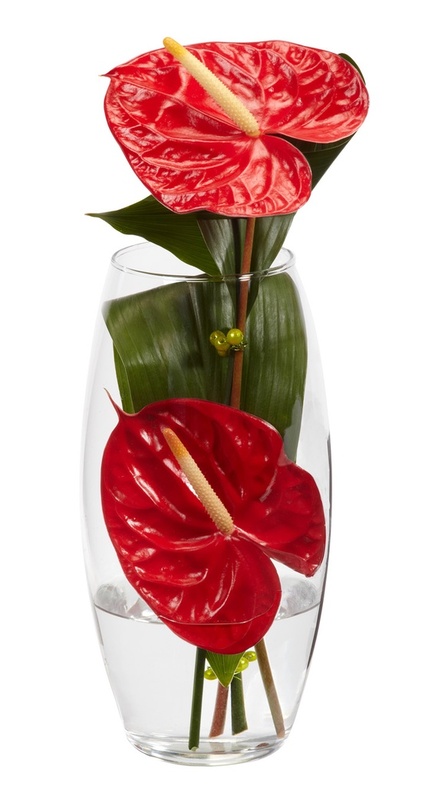 Heart-shaped anthurium and ginger come in Valentine’s colors but any tropical arrangement will be impressive. 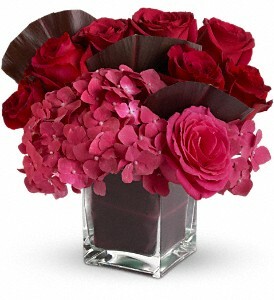 Hydrangea is also a great choice with its fluffy, cloud-like blossoms. 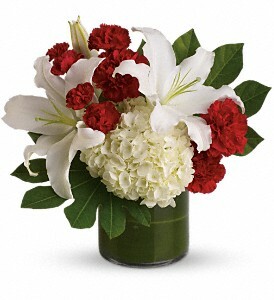 Soft white hydrangea paired with pink or red flowers is elegant and can fit into any budget. 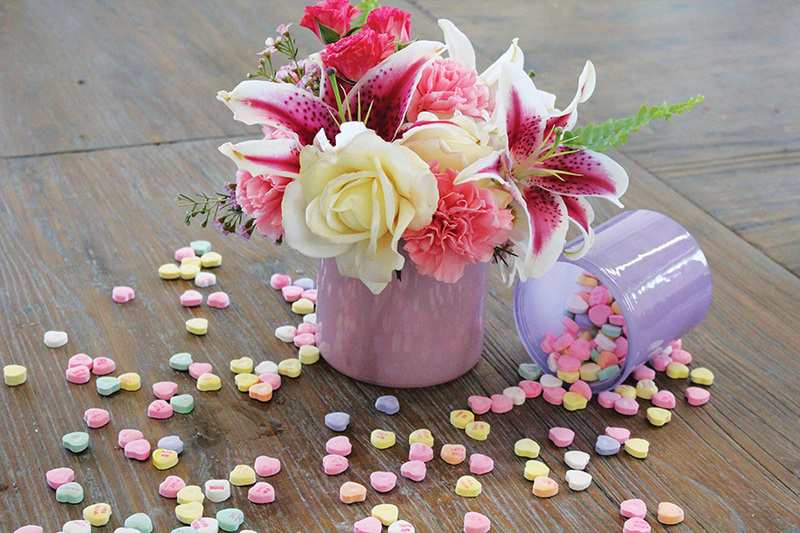 After roses, stargazer lilies are the most popular flower choice for Valentine’s Day. 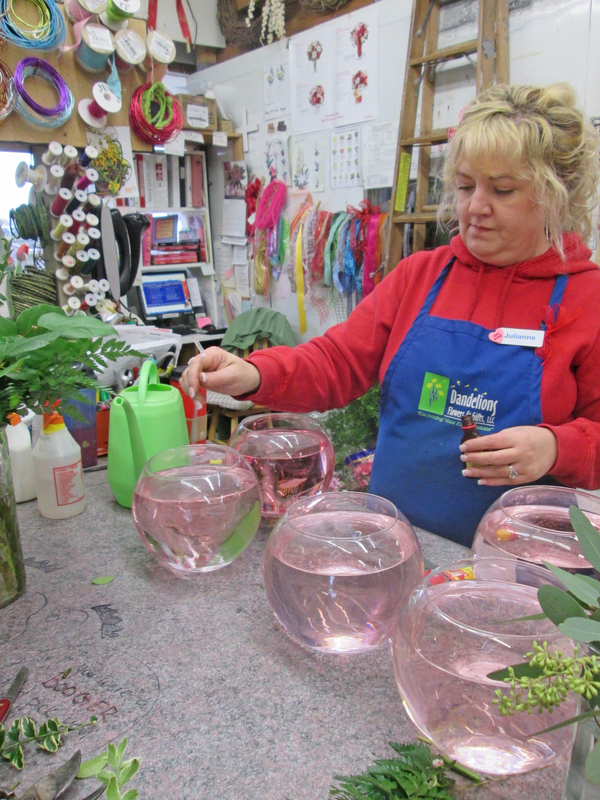 Their sweet fragrance fills the air and they have a beautiful pink color. 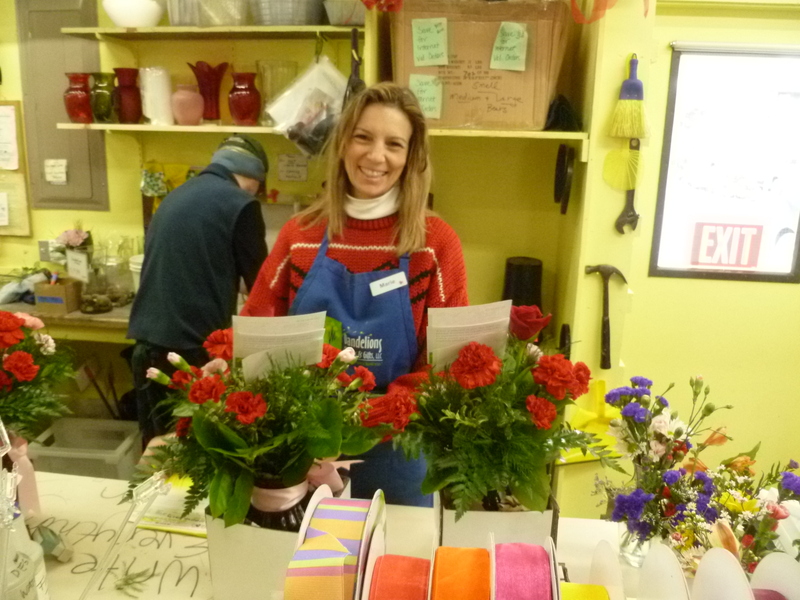 Are you stumped on what to say on your Valentine’s Day card? 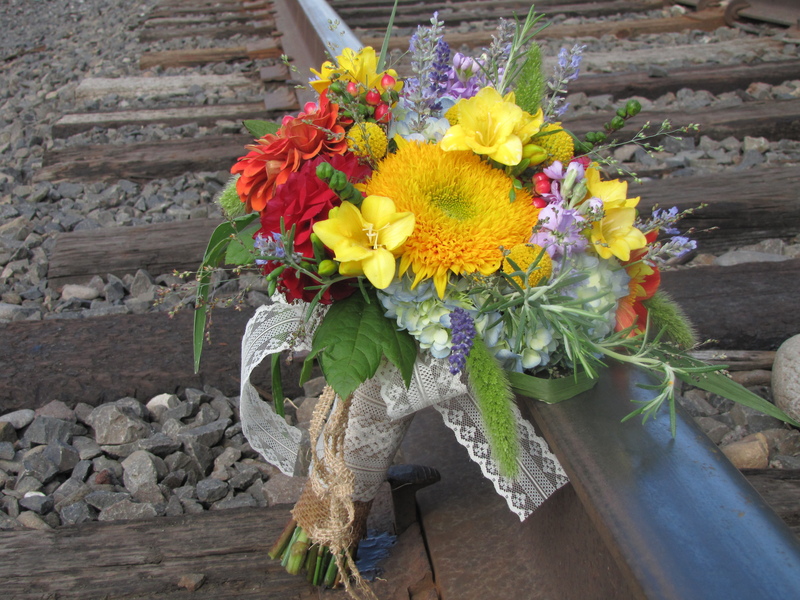 The most important thing is that it is sincere and heartfelt. 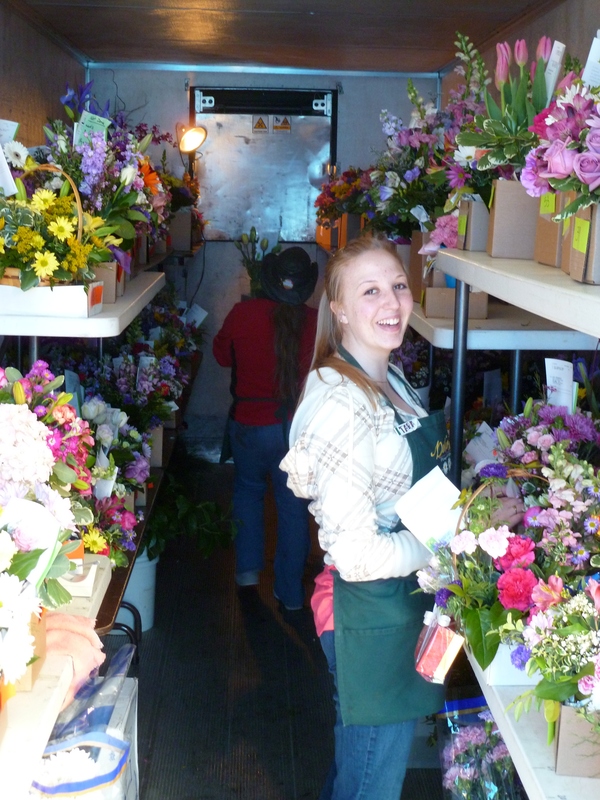 But if you need a little inspiration we have some ideas to get you started. 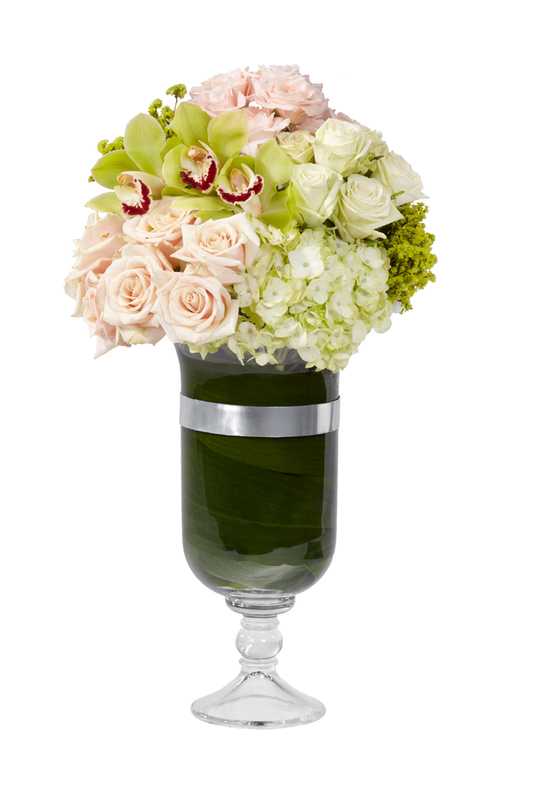 Sending flowers early on the 12th or 13th with a card message that says “I just couldn’t wait to say ‘I love you’ ” is a great idea. 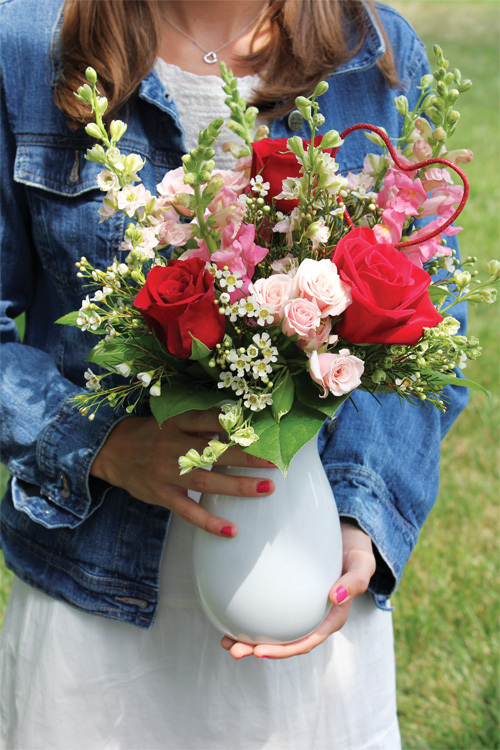 Since Valentine’s lands on a Friday this year this allows your Valentine to enjoy her flowers at school or the office for longer and makes you look great.